A cleansing conditioner for normal to oily hair. Faith in Nature's Tea Tree conditioner contains naturally antiseptic tea tree oil to invigorate your senses whilst cleansing your scalp. 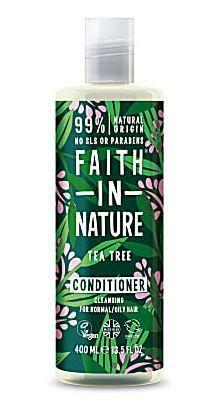 How to use Faith in Nature Tea Tree Conditoner; After shampooing, apply conditioner to damp hair. For best results leave on for 5 minutes then rinse well. In case of contact with eyes, rinse with clean water immediately, If irritation occurs, stop use. Keep out of reach of children.